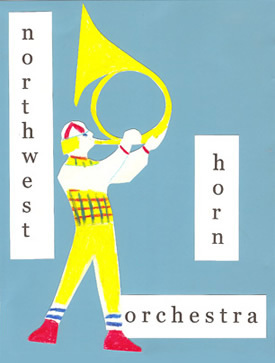 For the 7th consecutive year, The Northwest Horn Orchestra presents an evening of eclectic musical sections. The NWHO is a rotating assembly of 18 French horn players from all of the major orchestras in Northwest Oregon. Joined by percussion and rhythm sections, the NWHO performs an unique blend of genres including classical, jazz, movie music, blues, and even rock. This unusual ensemble aims to redefine what a collection of classical instrumentalists can do with a program of original arrangements and compositions in a light-hearted, fun environment. Our Program: Works by Handel, Satie, Copeland, Tchesnokov and ABBA. 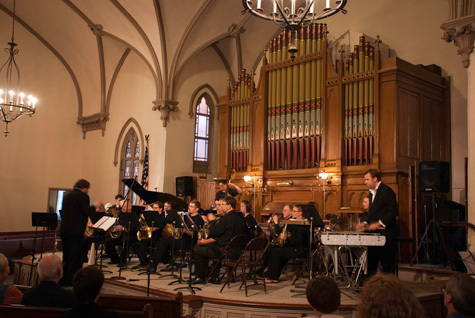 Our 2013 commission by nationally acclaimed, Northwest Composer Michael Johanson, Assistant Professor of Composition at Lewis and Clark College. Original arrangements of pirate music, broadway show tunes, alphorns and the usual antics. Expect the unexpected.